Oniwakamaru grew up to be the great Japanese hero Benkei, but before that... His early name meant 'demon child' and he was a bit hard to handle. He was extremely strong and violent. His mother was pregnant with him for three full years. Is it any wonder that he was born with a full head of hair and teeth and was naturally precocious. At the age of 8 he was asked by the priests of Kaminokura to move a huge boulder. He did it easily. Because of that they took him into their program, but he turned out to be too difficult to handle. "As a result, they [sent] him to a more severe temple to be raised as a priest." Was this the temple at Shoshazan seen here? We'll figure this one out in time. 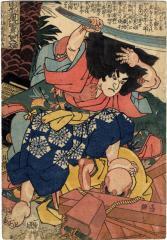 There is another Kuniyoshi print triptych in the Lyon Collection which relates to this one: #1239. It too shows a young Oniwakamaru acting out violently against his 'protectors'. Illustrated in color in Ukiyo-e: The Art of the Japanese Print by Frederick Harris, 2010, p. 151. --- Notice that there are three figures involved in this struggle. One is barely visible behind our hero and the other one is prone under Oniwakamaru's left foot.